The most important concept embedded in the workings of UODA is the one to build moral and ethical human resource. For a long time UODA has applied this ideology in the running of the institution, after the concept being founded by its President Professor Mujib Khan. UODA is now delighted to take initiatives to expand its social work and ethical commitments worldwide with other institutions overseas, such as the RINRI Institute of Ethics in Japan. Near the end of 2015, a team of members from the RINRI Institute of Ethics in Japan visited UODA to promote cultural exchanges between Japan and Bangladesh through UODA. They emphasized the importance of ethical values and had discussions with the team at UODA including UODA’s President, Professor Mujib Khan. 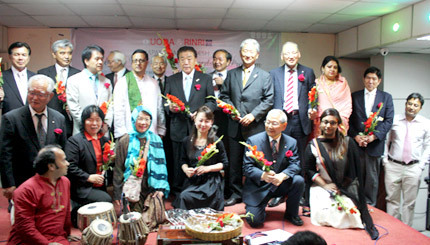 Links were made through UODA’s Department of Fine Arts and cultural programme was held to welcome the initiative. The team at UODA, including President Khan, further visited Japan and the institution of RINRI and its Chairman (insert name of Chairman of RINRI), to take additional steps of working together with this idea in the social field. A Memorandum of Understanding was signed to promote the works of UODA students and teachers at Japan and vice versa, in order to uphold and contribute to the ethical work done by the two Universities in the social field. The photograph shows the team of UODA and RINRI at their institution in Japan.